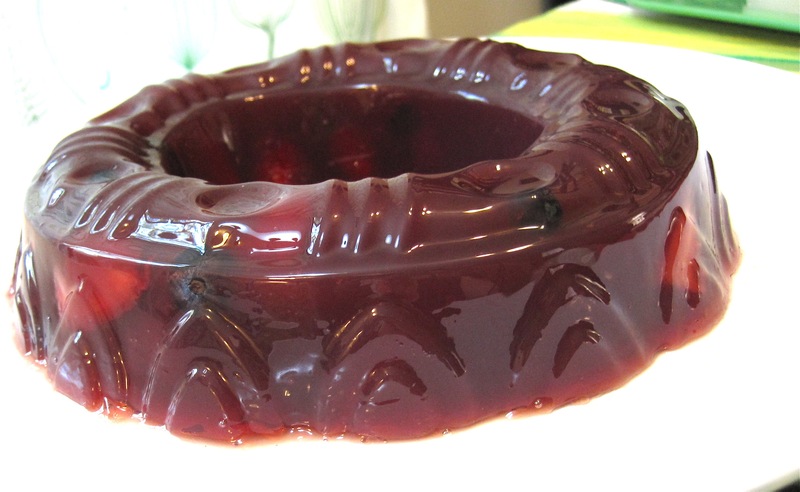 I had fantastic plans for this year’s Valentine’s Day gelatin mold – it was going to be the gelatinous exemplification of my disillusioned feelings towards this holiday, while paying tribute an amazing band that wrote at least 69 of my favorite love songs. 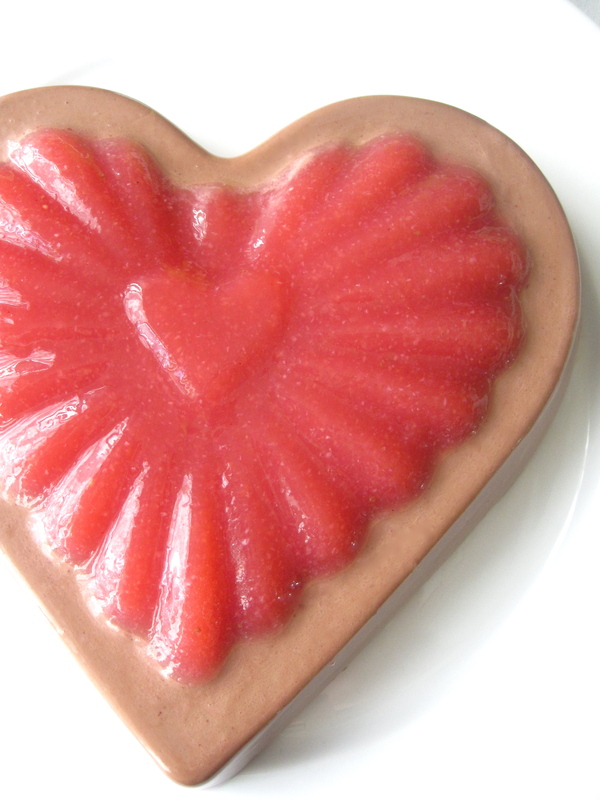 However, since the super boozy gelatin of my imagination requires a great deal of work (including my friend Matt’s assistance in using a kitchen floor vacuum former), it will not be completed in time for V-Day. Therefore, I’m re-posting last year’s popular chocolate and strawberry panna cotta instead. If you are not a fan of intense dark chocolate, reduce the baking cocoa to ¼ cup. Add two tablespoons of your favorite liqueur to liven things up. 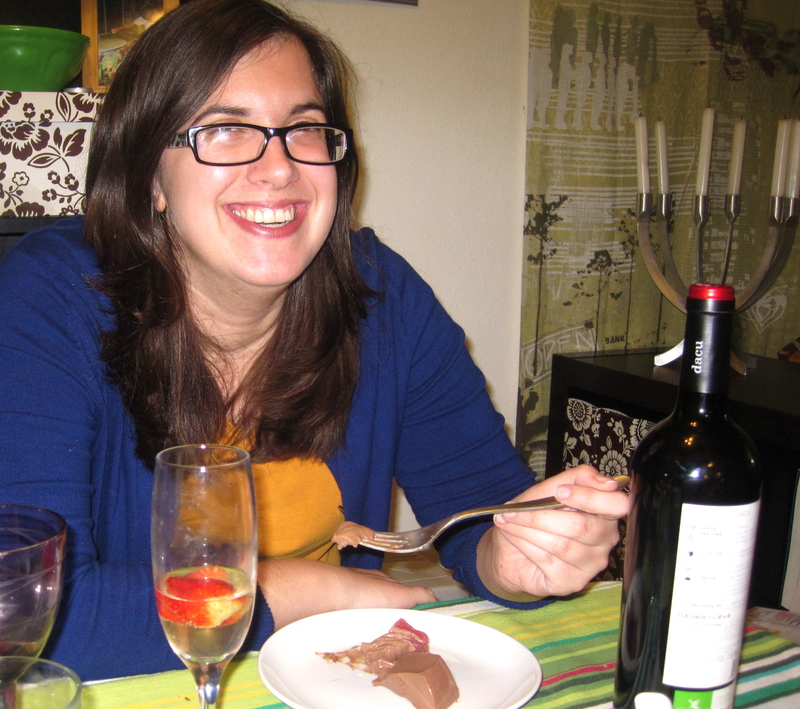 An orange or raspberry liqueur would nicely compliment the chocolate. Replace strawberries with raspberries, blackberries, or blueberries. Orange or tangerine juice would work as well. Instead of adding a fruit layer, make a blackberry syrup or strawberry coulis. Instead of having two layers, add ¼ of pureed and strained berries to the chocolate panna cotta. Reduce heaving whipping cream to 1 ¾ cups. Add a ½ cup of a flavored simple syrup (see chocolate cardamom panna cotta), reduce milk and cream by ¼ cup each. Put ¼ cup of cold water in a medium bowl and sprinkle 1 packet of gelatin on top of the water. Set bowl aside. Put water and sugar in a small saucepan over medium heat and bring to a low boil until sugar dissolves. Remove from heat and add to the bloomed gelatin. Stir until gelatin dissolves. Stir in pureed strawberries. Pour mixture into mold(s). Put in refrigerator until almost set. It should stick to your fingers when slightly touched. Sprinkle the packet of gelatin on top of ½ cup cold milk. Set aside for 5 minutes. In a small saucepan heat up cream and sugar. Add cocoa a little bit at a time and stir thoroughly. If clumps of cocoa remain, strain to remove. Once sugar dissolves, pour over the bloomed gelatin. Stir until gelatin dissolves. 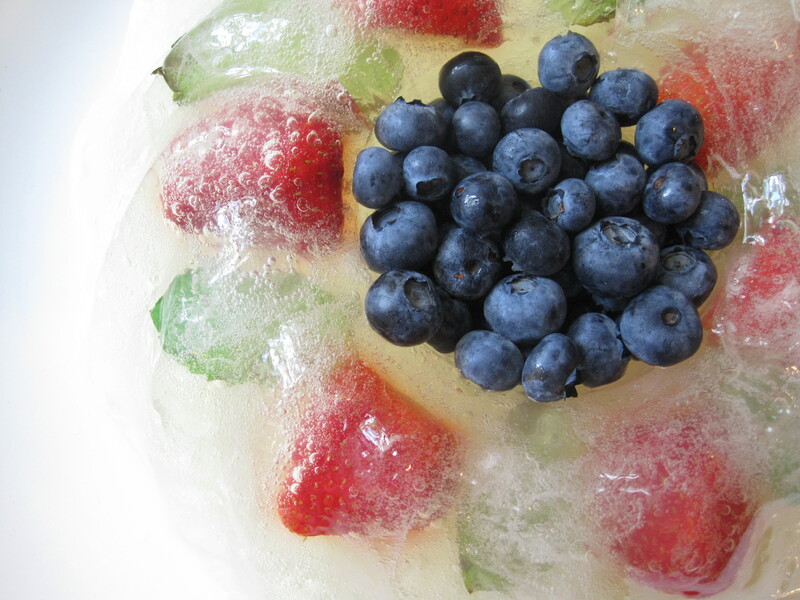 Refrigerate until not set, but cool. Pour into mold(s) and refrigerate for 4 hours. To remove gelatin, put mold into a bowl or sink full of hot water for a few seconds. After removing from hot water, gently shake the mold side to side. Put plate on top of mold and flip over. If gelatin does not come out, try repeating the process. Instead of Valentine’s Day, this year I celebrated Galentine’s with my single girlfriends. We considered it a celebration of the love we have in our lives – the love of our friends. This chocolate and cardamom panna cotta with a strawberry layer on top was the end to a decadent and labor-intensive meal consisting of super fancy cheese and homemade raviolis. Chocolate and cardamom – where do I begin? As my friend Laura said, “The chocolate and cardamom are having babies in my mouth!” The mellow cardamom complimented the rich chocolate – it made the dark chocolate seem almost darker. But in a good way. The addition of the thin strawberry layer on top brightened the intense dark chocolate creaminess. Add two tablespoons of your favorite liqueur to liven things up. An orange or raspberry liqueur would compliment the cardamom and chocolate. Instead of adding a fruit layer, make a raspberry or strawberry coulis. Combine water with sugar in a saucepan and bring to a low boil. When sugar dissolves, remove from heat and add cardamom pods. Cover pan and let sit overnight. In the morning, strain the syrup and store in an airtight container in the refrigerator. 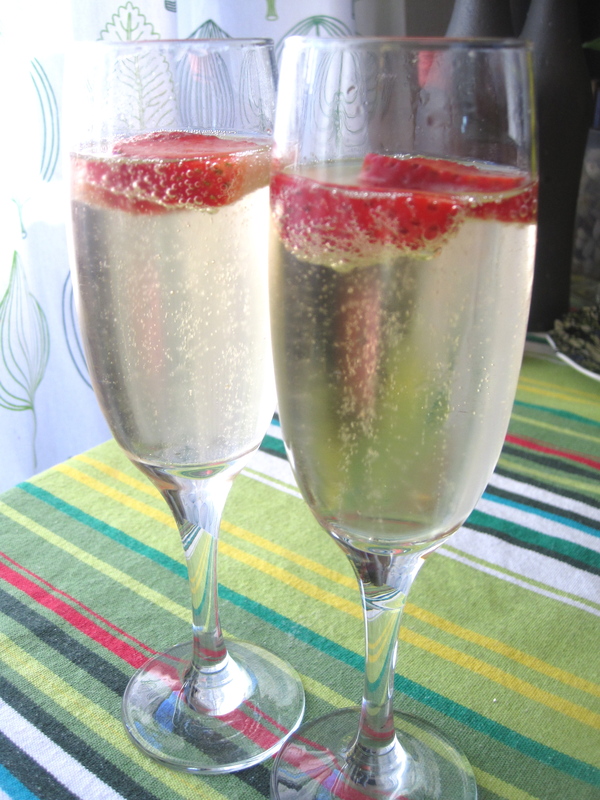 We added cardamom simple syrup and strawberries to our glasses of Cava – it was fantastic! Sprinkle the packet of gelatin on top of ¼ cup cold milk. Set aside for 5 minutes. In a small saucepan heat up cream, sugar, cardamom simple syrup. Add cocoa a little bit at a time and stir thoroughly. Once sugar dissolves, pour over the bloomed gelatin. Stir until gelatin dissolves. Refrigerate until not set, but cool. Pour into mold(s) and refrigerate for 4 hours. Now, I realize I say this often, but this gelatin mold may be my new favorite. 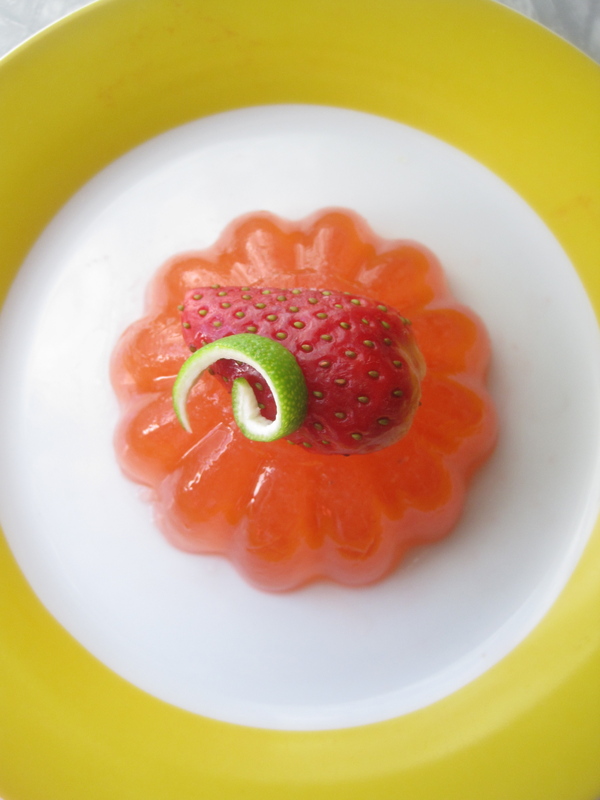 The fresh pureed strawberries combined with lime juice, tequila, and quality orange liquor created a delightfully sweet and tangy gelatin like none I have experienced before. It tasted like a gelatinous citrus-strawberry aqua fresca, with tequila. 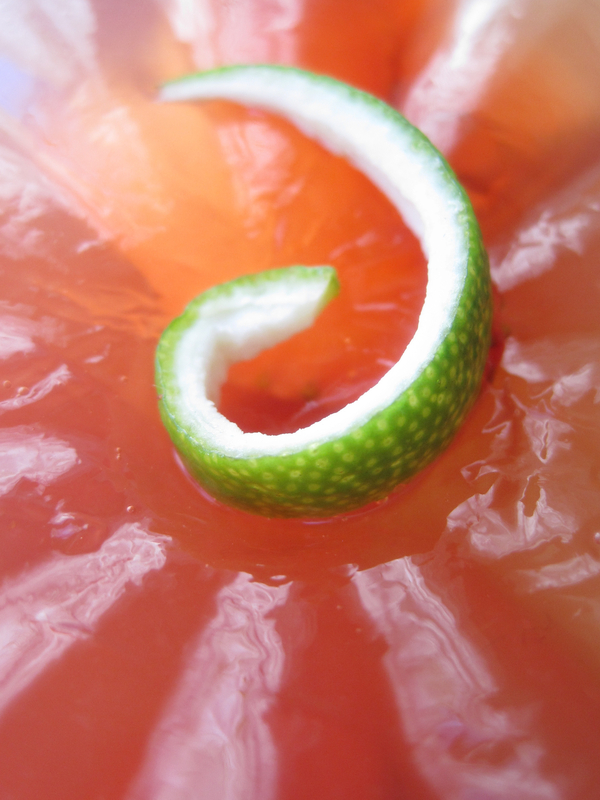 The key to a margarita gelatin mold is “Top Shelf” booze. Here I used Hornitos Resposado and Paula’s Texas Orange Premium Liqueur. Enjoy and Cheers! Put water, sugar, and lime juice in a saucepan over medium heat and bring to a low boil until sugar dissolves. Remove from heat and add lime zest. Let stew for 10-minutes. Strain the lime syrup and add to the bloomed gelatin. Stir until gelatin dissolves. Stir in tequila, triple sec, and pureed strawberries. Spoon mixture into mold(s). Put in refrigerator until set, at least 4 hours. The margarita – a killer combination of tequila, triple sec, and lime juice – is the best of Texas in a glass. And as a Texan and cocktail enthusiast, I take margaritas very seriously. When making them for parties (or just for myself with homemade tortilla soup), I use fresh limes, the best quality alcohol I can afford, and classic margarita proportions (1.5 oz tequila, 1.0 oz triple sec, 0.5 oz lime juice). For booze, I am presently enjoying Hornitos Resposado – it’s spicy, sweet, and affordable. And instead of cheap triple sec, I prefer Paula’s Texas Orange Premium Liqueur. All this creates a lovely sweet and sour combination with no yucky cheap booze or sour mix aftertaste. 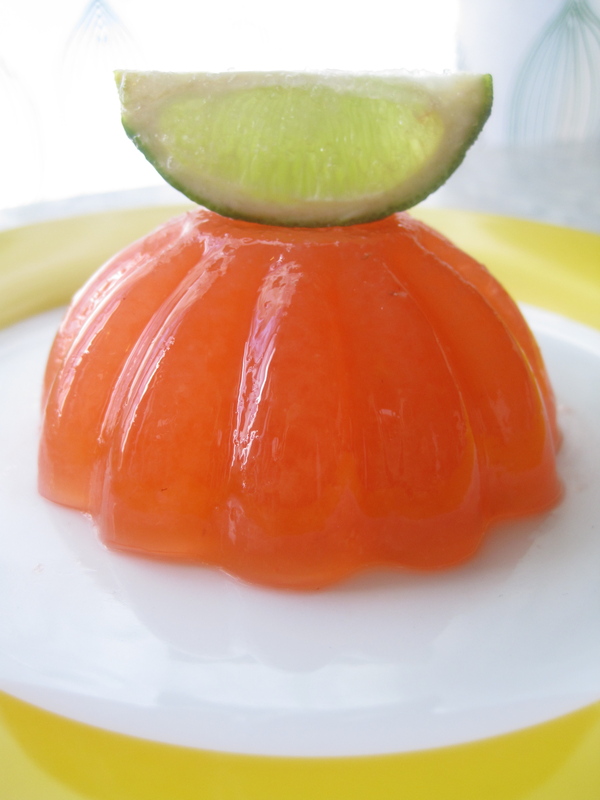 I was originally weary of creating a margarita gelatin mold – cocktail-based gelatin molds are a tricky (and expensive) ordeal! I typically experiment with two or three recipes before creating one worth eating. Shockingly, this mold turned out great after just one trial. 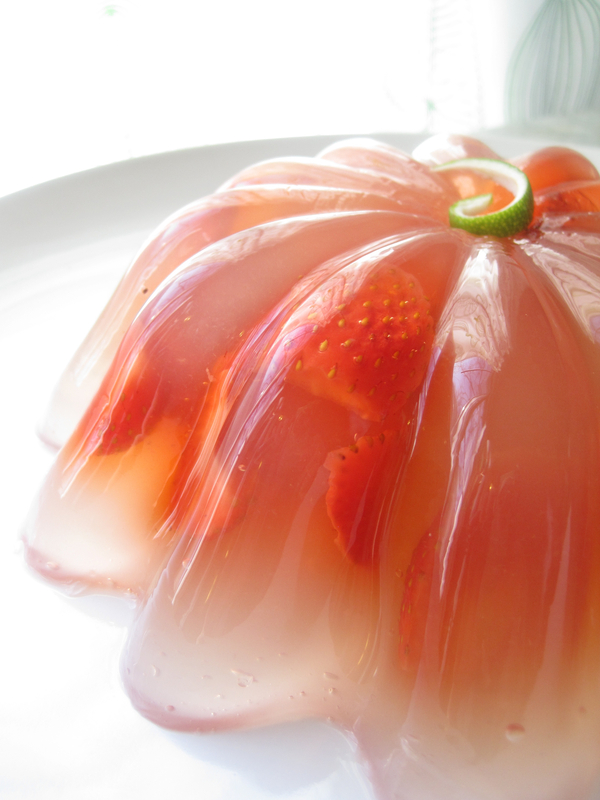 (I believe the key to cocktail-based gelatin molds is decent quality alcohol – use poor quality booze, and the gelatin mold will taste like a sweet, sticky, cheap boozy mess.) Along with “Top Shelf” booze, the strawberries provided visual interest and sweet fruity tastiness. Honestly, my friends and I were surprised how good this turned out! 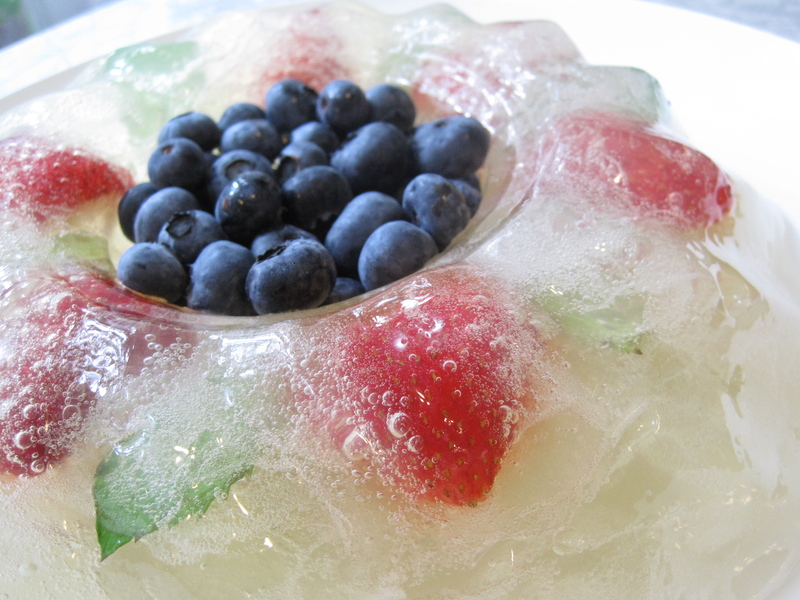 Given it’s versatility, I plan on several more margarita-inspired gelatin molds in the future. Put rest of water, sugar, and lime juice in a small saucepan over medium heat and bring to a low boil until sugar dissolves. Remove from heat and add lime zest. Let stew for 10-minutes. Strain the lime syrup and add to the bloomed gelatin. Stir until gelatin dissolves. Stir in tequila and triple sec. Put mixture in refrigerator (or freezer) until thickened to a soft gel consistency. It should be easy to stir but thick enough to hold the strawberries. Stir in strawberries and spoon mixture into mold(s). Put in refrigerator until set, at least 4 hours. This mold may not be the prettiest I’ve made, but it was definitely the tastiest. Inspired by this mold, my ingredients included 100% pomegranate juice, vodka, sugar, strawberries, raspberries, blackberries, and blueberries. I worried the combination would demonstrate too tart, but the sugar and berries nicely balanced the pomegranate and vodka. Put pomegranate juice and sugar in a saucepan over medium heat and bring to a low boil. Once sugar is dissolved, remove from heat and add gelatin. Stir until gelatin is fully dissolved (approx. 2 minutes). Transfer liquid to a bowl and stir in the cold water and vodka. Put mixture in refrigerator (or freezer) until thickened to a soft gel consistency. It should be easy to stir but thick enough to suspend the berries. Stir in berries, and spoon mixture into mold. Put in refrigerator until set, at least 4 hours.